Scott R. Paeth, The Niebuhr Brothers for Armchair Theologians, Illustrations by Ron Hill (Louisville, KY: Westminster John Knox, 2014). Furthermore, Obama argued, though war may be a last resort in foreign policy, in a world of tragic human imperfections, the instruments of war are sometimes necessary to keep the peace and redress injustice. Such language echoes that of Reinhold Niebuhr, whom Obama has claimed as an intellectual influence. Though Niebuhr was among the most eminent Christian theologians and ethicists of the 20th century, and his distinctive form of political realism attracts the attention of secular political philosophers and pundits, he is perhaps still not among the best understood of 20th century religious thinkers. The same could be said of Reinhold's younger brother, H. Richard Niebuhr, whose work has been seminal for theologians and ethics even though he is less famous than his more outspoken brother. Thinkers as divergent as James Gustafson, Gordon Kaufman and Hans Frei can lay claim to aspects of his interdisciplinary intellectual output, which ranged over the areas of epistemology, ethics, sociology of religion and constructive theology. For these and other reasons, Scott R. Paeth's superb primer on the thought of the Niebuhr brothers is a most welcome addition to the burgeoning body of secondary literature analyzing and applying their work. Paeth, Associate Professor of Religious Studies at DePaul University in Chicago, works primarily in the fields of public and political theology, and is also a blogger. Like other volumes in this series, his text offer educated lay people and students a concise and readable yet substantial entrée into the lives and thought of the two German American pastors and religious thinkers whose bodies of work, along with that of Paul Tillich, have exercised the most decisive impact on the course of mainline Protestant thought in the 20th century. The time is ripe for this book, especially since Reinhold's work in particular is receiving renewed and more careful attention today. This text is especially suited for individual study, for a parish adult education forum or an undergraduate survey course in North American religion, ethics or political thought. The structure of the Paeth's text is roughly chronological, guiding the reader from the childhood of Reinhold and Richard in the 1890s in Missouri and Illinois to their religions and vocational formations in the German Evangelical Synod (which later was merged into the Evangelical and Reformed denomination and later the United Church of Christ), to their careers as pastors and professors at Union Theological Seminary and Yale University, respectively. Central to this narrative also is the complex, often fraught story of how the Niebuhrs related to and impacted the public issues and events ranging from the two world wars, the social gospel movement, socialist politics, the Cold War, and for Reinhold the Civil Rights movement and Vietnam war. (H. Richard Niebuhr died suddenly in 1962, whereas Reinhold, whose prodigious productivity was hampered by a stroke in later years, lived until 1971). Though the basic structure of the text is chronological, the chapters are somewhat thematically organized, dealing with the emergence of Christian realism, issues of war and peace and the conflicts between the ethics of responsibility and the impetus to live a distinctive life of Christian discipleship. The life-work of both thinkers is interspersed throughout the texts. Though I think this was probably the correct editorial decision, it does perhaps heighten the key challenge that faces the new student of the work of the Niebuhr brothers - namely, to appreciate their common heritage and areas of substantial agreement without conflating their work. The brothers did have significant disagreements, including a key controversy that spilled out into public discussion in the early 1930s. Though Paeth's exposition is clear and straightforward, the reader unfamiliar with the Niebuhrs will have to pay attention to which of the brother's work is under discussion at any given point of the text. Ron Hill's cartoon illustrations give flavor and a touch of humor to the texts, but I at times found it difficult to identify which drawing was of which brother. Remembering that Reinhold was taller and more outgoing than his brother helped me navigate the illustrations. Embedded in the narrative are concise and lucid summaries of the major works of the two Niebuhrs, which make this text useful as a study guide or a refresher for someone who hasn't read the Niebuhrs in a while. Thus, we can see how Reinhold's realist political theology emerges in dialogue with the more sociological and historical early works of his brother. We get a good sense of Reinhold's mature Christian anthropology in his magnum opus, The Nature and Destiny of Man and we are able to track the major arguments in such texts as Richard's The Meaning of Revelation and what is perhaps his most famous book, Christ and Culture. 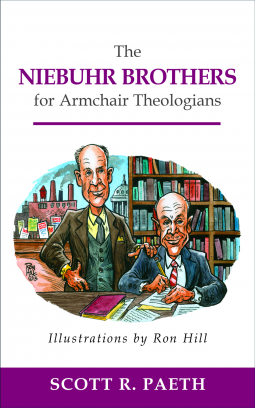 In two posts to follow I will use Paeth's text as an entry into a key debate between the two Brothers on the topic of Christian political involvement and I will examine further the ongoing legacy of the Niebuhr brothers for Christian thought today. Well, as Robert Frost wrote "'Good fences make good Niebuhrs." Thanks for the heads-up of a review. And more, thanks for your ongoing blogging.